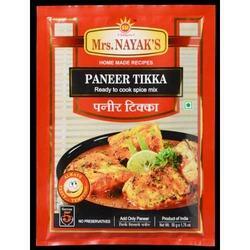 Leading Manufacturer of paneer tikka, paneer makhanwala, methi mutter malai, veg kolhapuri, paneer makhanwala cooking spices and ready to cook paneer tikka from Pune. 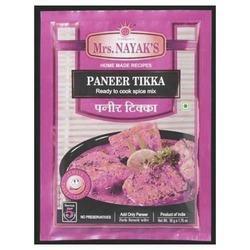 Our organization is instrumental in offering superior quality Paneer Tikka (No Onion No Garlic). These are high quality spices that are processed in the accordance of industry set parameters. Offered products are without onion and garlic but rich in essential vitamins. These products find their application in domestic kitchens, hostel and railway canteens and restaurants. We assure time stipulated delivery of our products. 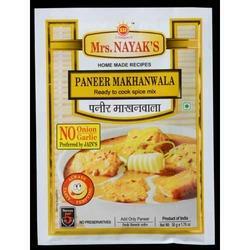 We are counted among the prominent suppliers of high quality Paneer Makhanwala (No Onion No Garlic). Offered products are manufactured from quality tested raw materials, under the strict supervision. These are ready to cook spices known for their numerous health benefits, metabolic functions and long shelf life. To dispatch best quality pure spices, our quality controllers carefully test it on various parameters. 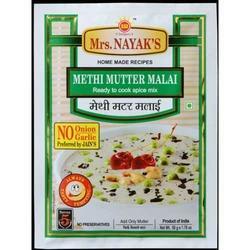 We are instrumental in offering premium quality Methi Mutter Malai (No Onion No Garlic) to our esteemed customers. These ready to cook spices are processed in the accordance of industry set parameters under strict supervision. Offered products are without onion and garlic and can be used by the pure vegetarians. Owing to our trusted logistic partners, we offer effective and timely delivery of our products. 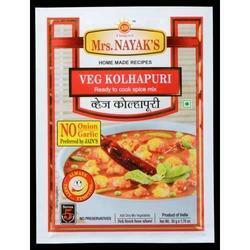 We are instrumental in offering highly nutritional Veg Kolhapuri at market leading price. These ready to cook spices are processed from the quality tested spices, under the supervision of expert professionals. Offered products are highly demanded in restaurants, canteens and domestic kitchens for cooking purposes. Our products are appreciated for their compositional accuracy, long shelf life and unadulterated nature. 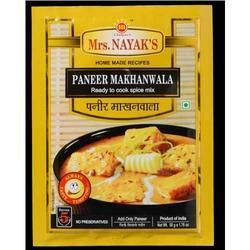 We are instrumental in offering a wide range of Paneer Makhanwala Cooking Spices to our valued customers. Our professionals process these spices by quality tested raw materials, under expert supervision. Offered products are widely appreciated for their rich nutritional content, compositional accuracy and numerous health benefits. Beside, with adding taste to the dish, these spices initiate metabolic and respiratory functions. 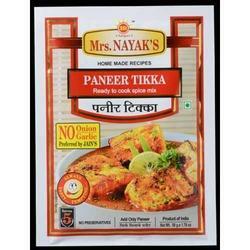 We are among the leading suppliers of high quality Ready to Cook Paneer Tikka. In the processing of these spices, we use superior quality raw materials, cutting edge technology and advanced machinery. Offered products are appreciated for their longer shelf life, effective packaging and the health benefits. Our products find their application in domestic kitchens, industrial canteens and restaurants for preparing paneer tikka. 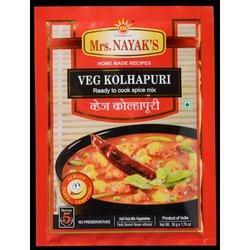 We offer premium quality Veg Kolhapuri masala in air tight packaging. These products are processed by freshly spices, under the supervision of qualified professionals. These are ready to cook spices offered at market leading prices. Offered spices add unique taste and flavor to the kolhapuri dishes.Our offered range of spices is highly acclaimed among the clients for their purity, freshness and longer shelf life. Our professionals accept Packed Paneer Tikka on special requirement from our clients. These contracts are reliable and appreciated for the quality of food items we offer. These food items are processed, under strict supervision and sophisticated processing environment. For the convenience of our clients, we offer time stipulated delivery of these contracts. Looking for Ready to Cook Food ?